EGAD LAUNCHES HISTORIC AUDIO TOUR ON SATURDAY NOVEMBER 3. 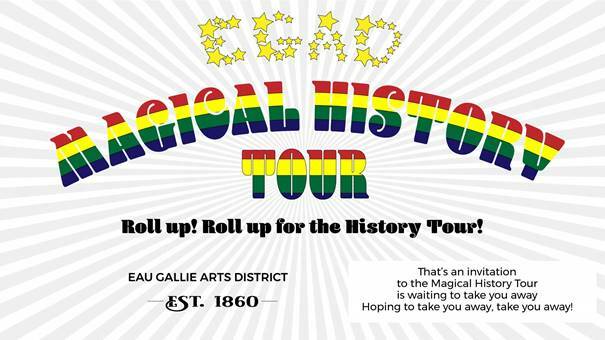 ROLL UP FOR THE MAGICAL HISTORY TOUR! Eau Gallie Arts District Main Street was awarded one of only three grants given this past year for inclusion in the walking tour that is heard through one’s own smart phone. The tour is limited to 12 tour stops and each stop has a two-minute narrative and includes historic photographs. Anyone may download the app and listen to the tour by foot, bicycle, or even car. In fact, you can even watch it on your phone from the comfort of your house, but the public is invited to come to Eau Gallie on Saturday morning, November 3, 2018, and join others doing the tour. The EGAD office will be open from the hours of 10 am to 1 pm to offer light refreshments, hand out printed maps and answer any questions. The office is located at 540 Montreal Avenue which is located at the back of the Highland Avenue parking lot. There will be a large yellow umbrella outside to help people find it. Come hear all about the origins of Eau Gallie, the founding families, the history of some of the buildings, and what started here (University of Florida) before moving elsewhere. Stop in to one of Eau Gallie’s restaurants afterwards for lunch and make a great day of it! It’s free to download the app and take the tour. We ask that patrons understand that some houses still have people living in them so please do not enter private property, knock on the door or peer in windows of any private home. Please remain in the public area.